Recently my desktop keyboard had an unfortunate encouter with…. well, the wall. After that incident I had been using an older keyboard that I had laying around. This old keyboard sucked. The ‘B’ key wasn’t always responsive, sometimes requiring a truely unreasonable level of force in order to activiate. 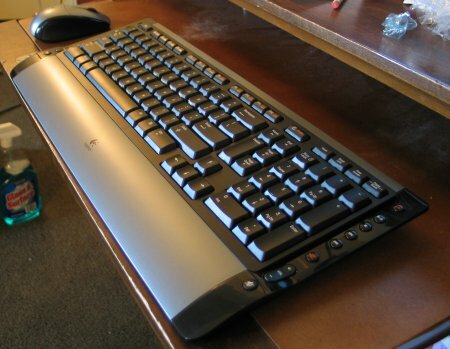 The other main (and maybe even larger) problem was that it was a beige keyboard. I hate beige computer equiment. It’s ugly. So far, the set up is working out quite well. There were a couple bumps in the road at the begining though. 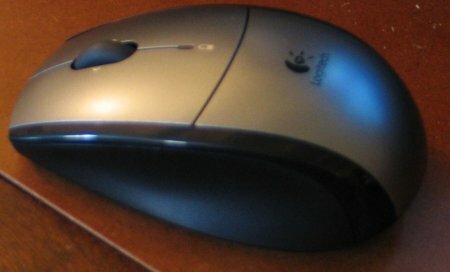 The software packaged with the package didn’t support Firefox as a web browser, so none of the hot key features worked to launch things in Firefox. Also, I couldn’t configure the tilt wheel to perform the ‘forward’ and ‘back’ browsing features in the browser, either. The Logitech website, however, had an update to the software, and now everything works fine with everyone’s favorite memory-hogging browser. The range on the keyboard is pretty good. I can use it to control iTunes’ behavior from across the room. The photo viewing hot keys are pretty useless. Why does someone need a dedicated “rotate photo” button that only works in the windows photo browser window? If I can get the zoom and rotate buttons to work in The GIMP, though, then they might be more useful. My only other complaint so far is the scrollwheel mouse button. 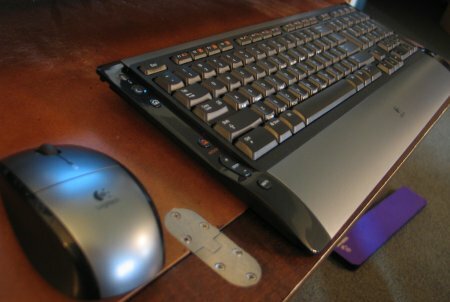 In order to activate it as the middle mouse button, it needs a little bit too much force to be comfortable. Trying to click it also frequently ends up in triggering one of the tilt wheel buttons. This will probably get better as I get more used to the feel of the mouse. In other news, I’m starting the process of redesigning this site and making it not so….. black and green. I’m probably going to use Jeremy‘s Cereal Port theme as a starting point, as I want the content area to resize. This is something that most WordPress themes, such as my current one, fail to do. The plan for the night? Well, I’m about to have some dinner, and then there’s a little gathering for my former fellow RD / newly promoted supervisor. As of today, she’s officially ABD. This entry was posted on Thursday, August 3rd, 2006 at 18:17	and is filed under News, work. You can follow any responses to this entry through the RSS 2.0 feed. You can leave a response, or trackback from your own site.